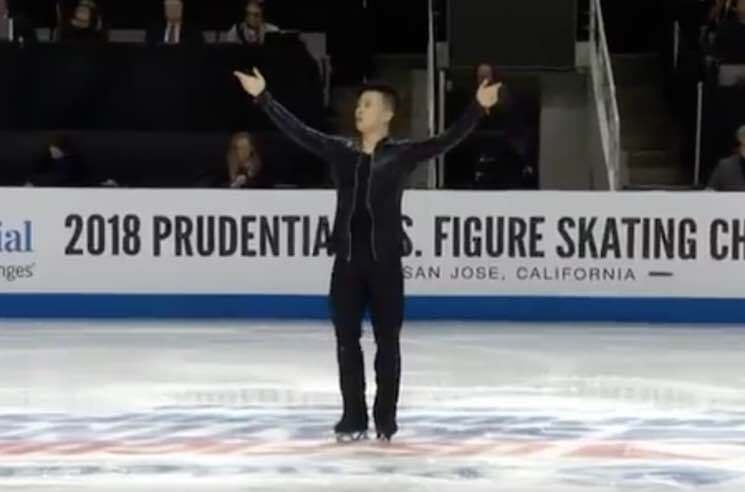 The upcoming Olympics in South Korea will mark the first games to allow figure skaters to ice dance to music with lyrics, and American skater Jimmy Ma is taking full advantage of the new rule. Yesterday (January 4), he turned the rink at the U.S. Figure Skating Championships in San Jose into a 2013 wedding dance floor, opting to perform his routine to the tune of Lil Jon and DJ Snake's ubiquitous hit "Turn Down for What." The 22-year-old athlete from Queens, NY, prompted enthusiastic reactions from the crowd and announcers alike — not to mention setting the internet ablaze. Even Lil Jon seemed to appreciate the shout-out, retweeting a Deadspin story about the performance. "We kind of wanted to make something that had a lot of excitement," Ma said in an interview with BuzzFeed. "Something to get the older generation excited and also draw in a new audience." Watch the on-ice spectacle below, and see some of the best Twitter reactions to the unlikely choice of skating soundtrack. Jimmy Ma is having a blast skating to DJ Snake and so am I watching it. The bass drop and then going into Turn Down for What after unzipping his pleather jacket. I am dead. Jimmy Ma out there skating to house remixes, looking like a guy my mother wouldn't have let me ride home from school with. Sadly Ma's performance to the sounds of Lil Jon didn't land him the top spot on the podium; he finished in 11th place, but will compete in the free skate competition tomorrow (January 6). It's not the first time Ma has skated to an unorthodox musical selection, either. Last year, he performed to an instrumental medley of Eminem songs. Watch footage from that below.